This time in Paris, I had an epiphany. A huge one: All these years, I have been wearing a false Chanel No. 5. Not fake, just false. That’s because what we know as Chanel No. 5 Eau de Parfum is not really the legendary fragrance created by Ernest Beaux for Mademoiselle Chanel in 1921. It is, in fact, Beaux’s parfum, as re-imagined for a more contemporary audience by Chanel nose Jacques Polge in 1986. And the difference, contrary to common belief, lies not just in the concentration of oils. In fact if, like me, you are only familiar with Chanel No 5 EDT or EDP, discovering the parfum will be like finding a completely different fragrance. Isn’t it just about the proportion of oils to alcohol? No, it’s not. Definitely and absolutely not. As you go up the fragrance ladder, it’s not just the concentration that changes but also the materials and their quality. The EDP and Parfum versions might, in fact, have additional notes that are left out of the EDT altogether because of their price and “heaviness” (EDTs are typically fresher and lighter). For example, it’s believed that only the Chanel No. 5 parfum contains jasmine from Grasse – the EDP is crafted with flowers from other, lesser sources. Impossible to say for sure but when you smell the two simultaneously, the parfum does deliver a fresher, more rounded jasmine story. The second thing you notice is that Polge has underlined the original’s bright citrusy top notes and made the vanilla drydown much warmer in order to create a modern twist. The creamy notes of peach that lace the rose, lily of the valley and jasmine heart are also more prominent, while the amplified voluptuousness of sandalwood and the darkness of leather and incense replace the plush, rich muskiness of the original. The EDP sillage itself is beautiful and long lasting but definitely less powerful. I would say that if the parfum is haute couture, the EDP is the Little Black Dress – both are thrilling in their own right but the former is definitely more majestic. While I use Chanel No. 5 as an example, the same story runs across all perfume houses, from Dior to Van Cleef & Arpels. What’s you take? Do you wear Chanel No. 5? Which one? 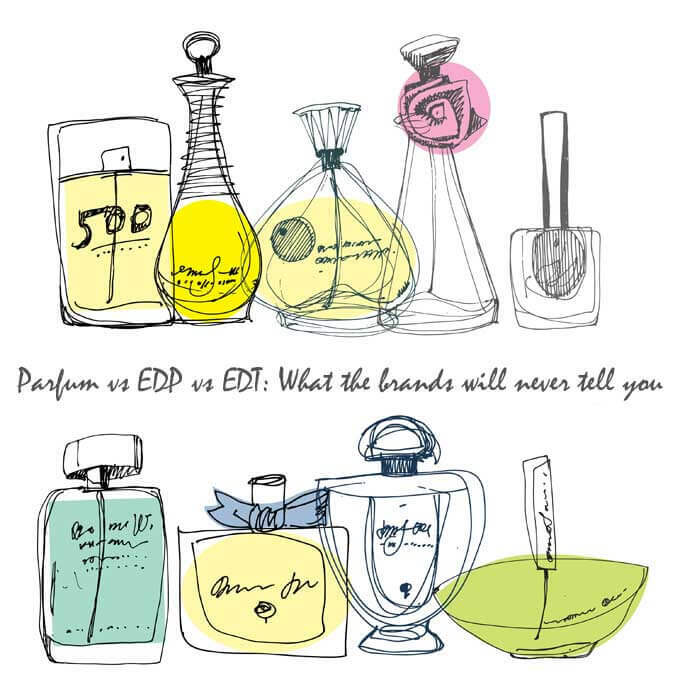 And would you rather buy a Parfum, an EDP or an EDT? Care to explain how the usage patterns and choice of a parfum, EDP and EDT differs or should ideally differ? I have a selection of parfums…but can never figure out how to use them! and EDTs work pretty much like bodysprays. How are they supposed to be used? I will be doing a post on exactly this topic early next week!